Moness Resort is one of the largest timeshare schemes operating in the UK, with their main base located in Scotland. There has been a huge increase in complaints and timeshare release enquires in recent months from customers with Moness Resort. If you believe you had a timeshare contract mis-sold to you by Moness Resort or you wish to be released from your timeshare scheme & points, please contact one of our experts at Mercantile Claims or fill in the compensation claim form below. We can help you cancel your Moness Timeshare Agreement Legally. Contact us Now to see if you qualify! The pool was FREEZING and the excuses just kept coming. My 19-month-old was shivering. Unacceptable I can grin and bear it for a paddle about but for my wife and child, it is absolutely unacceptable. Causing more stress after a long journey and with a tired child, we had to get a carryout and throw the meal we wanted away. We just kept getting “I can only apologise” – like a mantra from a failing and fallen resort that was once of value and a credit to the country. I was angry with the management of this resort. Changing in the changing rooms and talking to other folks in the resort – it was the same experience all over. Rubbish. We were offered a reduction in a booking in October? Why would we want to holiday in this excuse for a resort after such a crap time ?? Yates B - 4 Star? Not Worthy of it! Hotel review of Moness Resort – Really looked forward to a night here as it looked so lovely from the outside, what a disappointment! First of all we were told Sundays breakfast was served till 11 then on arrival were told it is 10.30. No big deal but that was just the start! Room was supposed to be a deluxe double! Was nothing deluxe about it! Filthy stained carpets, no nice toiletries like all other 4 star hotels and it was freezing!! Asked to move and was given option of another room but this one had wires falling out the back of the tv so agreed to stay in freezing dirty room to avoid touching the tv! Room warmed up slightly so was just bearable! Went for dinner where we were told a vegan menu was available. Menu was rubbish no effort at all and I ended up with soup! Was told no rolls were available as they had milk powder in them so was given soup and oatcakes!! No hot option of pudding either. 4 star??? Bed was lumpy and breakfast was awful! No options for non meat eaters,not even margarine provided, so had dry toast and beans. Had to ask for soya milk. I started to explain to the grumpy faced waiter that I don’t eat or drink dairy but was just told ‘yeah ok’ and handed the carton! No jug just here have this! There are some amazing b&bs in Aberfeldy so my advice is to go to one of them! This place is no way a 4 star! Dirty, cold and terrible customer service from staff who have no respect for their customers or care about dietary requirements. A veg sausage wouldn’t have been hard to provide! Not even an apology! I booked Moness for my partners Birthday. The cottage it’s self was lovely however slightly outdated, the door handle on the bathroom door was broken and the shower was also broken. We also received a phone call the day before from a very helpful lady called Nina, to say there were spaces available for the Tribute night- The Jersey Tones. This included a 3 course meal and a disco at the end. It was a great atmosphere in the Marquee however the meal was absolutely dreadful, numerous complaints on the night were given to the staff but due to this our night was cut short and we had to leave the tribute night. I then contacted the reception the next day to state this and cancel the reservation we had for the following night for the restaurant, where the food seemingly was made from. On our check out period we did choose the express option as we had somewhere to be, and I contacted the hotel to discuss the issues we had faced. It seemed as if they didn’t care, they stated they did not have any other complaints from that night, which I know is untrue and it felt as if they were trying to shoo us away. All in all, it would be a great place for a relaxed holiday however I would not recommend the restaurant and if you have any issues then there would be no point in raising these. Never again will I be back or recommend anyone to go! staff need sent on customer service training, cottages need revamped and they need to learn how to communicate!! requested a bath and travel cot weeks before arrival never received this after asking hundreds of times! 1st cottage was FILTHY!!!! was told we couldn’t be moved as they were full debated just leaving and booking somewhere else, eventually moved us cottage still no travel cot! having to put a Moses basket in between two chairs is not good enough!!! booked a meal for my sister’s 30th birthday…there was no booking!!!! my sister and her husband had a spa day booked but the lunch included had been booked for.the day before and no one informed them! reception staff are clueless with no mannors!!!! only nice thing about the place is the loccation. so disappointed we booked here to celebrate my sister’s 30th there’s much nicer places out there for the same money! 4 star? Not worthy of it! Really looked forward to a night here as it looked so lovely from the outside, what a disappointment! First of all we were told Sundays breakfast was served till 11 then on arrival were told it is 10.30. No big deal but that was just the start! Room was supposed to be a deluxe double! Was nothing deluxe about it! Filthy stained carpets, no nice toiletries like all other 4 star hotels and it was freezing!! Asked to move and was given option of another room but this one had wires falling out the back of the tv so agreed to stay in freezing dirty room to avoid touching the tv! Room warmed up slightly so was just bearable! Went for dinner where we were told a vegan menu was available. Menu was rubbish no effort at all and I ended up with soup! Was told no rolls were available as they had milk powder in them so was given soup and oatcakes!! No hot option of pudding either. 4 star??? Bed was lumpy and breakfast was awful! No options for non meat eaters,not even margarine provided, so had dry toast and beans. Had to ask for soya milk. I started to explain to the grumpy faced waiter that I don’t eat or drink dairy but was just told ‘yeah ok’ and handed the carton! No jug just here have this! There are some amazing b&bs in Aberfeldy so my advice is to go to one of them! This place is no way a 4 star! Dirty, cold and terrible customer service from staff who have no respect for their customers or care about dietary requirements. A veg sausage wouldn’t have been hard to provide! Not even an apology! Good points? Plenty parking and lovely surroundings. That’s it! DISGRACEFUL ACCOMMODATION – DO NOT GO! On arrival at the cottage, I was bitterly disappointed as soon as I walked in the door of the cottage. It was certainly not 4* luxury as advertised, on the contrary, it was very tired, in dire need of a refurbishment and was not fresh. ie there was a very stale smell in all rooms. The previous residents may have been smokers. 1. There were numerous cigarette ends lying at the front door and the bin was overflowing. I reported this and it was emptied immediately. 2. The bed sofa in the sitting area was the most uncomfortable bed I have ever slept in. I’ve had a sore back since. 3, The television did not work. The Guest Information sheet told us how to operate – this was impossible as it asked us to press the STB button on the Amino remote – we did not have an Amino box. Eventually, my husband managed to find BBC 1 – this was the only channel we had and he spent a considerable time working on this. I reported this to reception and the maintenance had left (it was just after 4.00 pm). The maintenance came on Sunday morning and fitted an Amino box and had the TV fixed. We did want the other channels on Saturday night though. 4. The cutlery was haphazard, nothing matched. The teapot was for 2 people and there were 4 of us. 5. The bathroom was dreadful – dark, dingy and badly in need of repair (see the bath panel). 6. The carpet had stains as well as a large stain on one of the sofa cushions. 7. On arrival at reception to check in we were given one towel voucher each for the whole stay. I have never encountered this as well as never had to pay for electricity. Our hot water heater was on all the time – it had a sticker beside it telling you not to switch off! 8. We couldn’t find the resort using satnav, we eventually had to call the hotel for directions. The satnav takes you into a housing estate. 9. No hairdryer in the house – had to be obtained from Reception – have never encountered this. I just did not feel comfortable in these surroundings – I expected more. We have stayed at other resorts recently – which are of a much higher standard and lower in price! 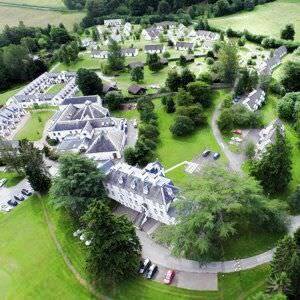 Of note: Duchally in Auchterarder in January at a cost of £235 for 4 nights – 5-star luxury. On arrival, we received a bottle of bubbly and a grocery starter pack. The house was a 2 bedroom house for 2 of us and it was absolutely beautiful and was so well equipped. In comparison to Moness and at a lesser cost, this was a real bonus. I wrote to Helen Davies the Manager and received a non-satisfactory, not entirely apologetic response and was disappointed with this. Also, it took her 4 weeks to reply. I would definitely say STAY CLEAR – not worth the discomfort/poor condition of the cottage. We had booked at 2-night weekend cottage stay. On arriving at the cottage we were met with a bin overflowing with empty beer bottles placed adjacent to the front door. Things did not improve as we entered the property. There was a rather horrible stench in the property. It could best be described as musty or damp. The stench was particularly prominent as we moved from the ground floor to the living area on the first floor. My wife and I are not complainers so we decided simply to open all the windows and go to the play park with our young daughter and then to dinner. We returned to the cottage for our daughter’s bedtime and the smell, whilst slightly improved, was still present. At that stage, we decided we would mention it to staff the next day so as not to disrupt our daughter’s sleep. At this point, I should say that the property was very dated. The carpet and sofa were very old. The kitchen was shabby. The cleaning standard also left a lot to be desired. There were cobwebs, dust on the towel rails and some unpleasant deposits on the walls. In any event the next day after having a swim I attended the reception area and asked if we could change rooms due to the smell which was lingering. The receptionist was not interested. After a brief chat with colleagues, she advised there was nothing she could do as the hotel was fully booked (a quick online search suggested otherwise – this was a Sunday). She belatedly said she would send “housekeeping” over and handed me the customer services manger’s card. I was amazed that no one from reception or management would even be curious as to a complaint regarding the odour in the property. About 30 minutes later “housekeeping” arrived. A young man handed me a wall mounted air freshener and told me to “slide it under the sofa” and a Febreze air freshener spray. That was the response to our concerns. Disgraceful customer service. The resort is as far removed from “luxury” as you are likely to find and we would never visit again. I would comment that the bar staff and restaurant staff were very attentive but not even their conduct could raise this above a one-star review. Finally, I note from other reviews and comments that the management adopts a very defensive approach to any negative comments. However, I would point out that after many years of travelling and having lived in a wide range of accommodation styles I have never felt compelled to leave a review of this nature until now which I think speaks volumes for our experience at Moness.